A good bottle of wine, a little candlelight and a succulent lobster or tender filet mignon: these are the culinary masterpieces that make life worthwhile. And vacation is no time to deny your urge to splurge.The restaurants in Big Bear may be chef owned, but there is no lack of imagination in their Fine Dining presentations. This guide should help you find the perfect bistro for dining. Several talented chefs have brought their skills to their own Big Bear restaurants. Notable among them is Stillwell’s where premium meats and produce are prepared with a Cal-Asian flair. People are buzzing about the Peppercorn Grill owned by Mike and Julie Hastings. Their take on Italian classics, (seafood, pastas, salads) is tempered by an adventurous, cosmopolitan spirit. Maui crab cakes, anyone?As always make a reservation whenever you can to guarantee a place. Especially on busy weekends. 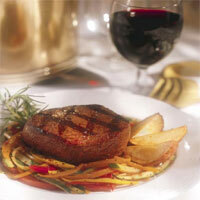 Steaks, seafood, prime rib, Italian cuisine, and more. As time goes by we’ll spotlight various fine dining hotspots, so check back frequently. Knickerbocker Mansion 869 Knickerbocker Rd.